The self is uncanny: ordinary and utterly odd. It is familiar – it is familiarity itself: what always is, so long as we are. But the self is also a puzzle, which has prompted over two millennia of bafflement and astonishment. So: the world. What do I see, exactly? I see a human at my letterbox, delivering a glossy real-estate brochure; a human stepping on a snail and swearing at the oozing dead thing; two humans kissing at a tram stop. I do not see perfectly unique beings. I see each as belonging to this one category, ‘human’. And this kind of thinking happens every day (without thinking about it). Along comes Plato, and things get weird: categories become more real than things. Plato’s Forms, or ‘Ideas’, are described as eternal, perfect: “uncreated and indestructible, never receiving anything into itself from without, nor itself going out into any other, but invisible and imperceptible by any sense”. There is a Form of the human that is more true than the warm flesh currently delivering photographs of the ‘neat as a pin’ two-bedroom apartment. This idea is bizarre, partly because we usually trust simple physical explanations. I see the pamphlet deliverer, for example, as the cause of the brochure’s arrival in the clogged box. There are other causes, but for Plato there is a more subtle cause at work: the very Idea of the human itself. Beyond ordinary cause and effect is a kind of transcendent cause: the idea that makes something what it is. We have no other notion of cause and effect, but that of certain objects, which have been always conjoined together, and which in all past instances have been found inseparable. We cannot penetrate into the reason of the conjunction. Hume isn’t saying that cause and effect are false. He’s saying that we never perceive them, and cannot think our way into their secrets. For Hume, Plato’s divine causes are just grandiose versions of ordinary ideas: causation is more custom than certified fact. Plato and Hume, opposed in so many ways, have something in common: they surprise us. The Scottish thinker makes dull habit surprising, just as the Athenian makes quotidian abstraction astonishing. What seems ordinary is actually, on reflection, quite strange. This feeling intensifies when we ask: who or what does the reflecting? Plato characterised the soul as an immortal intellect, able to comprehend the Forms. To see true justice and beauty was to see past physicality to the eternal and universal ideas, which existed beyond time and space, “beyond the heavens”. In this vision of the universe, the self can be a pool of calm water in a storm. The storm is the world: constant change. And we too are storms: fickle, fleshy creatures, misled by our senses and misguided by our instincts. The point of philosophy is to overcome the caprice and illusion of the “tainted and impure” body, and allow the soul to dive into the still sea of being. In other words, for Plato the self exemplifies the really real. Insofar as truth is divine, the self is divine: immortal and immaterial. In Plato’s Phaedo, Socrates argues against Greek orthodoxy in favour of the deathless soul – the need for ongoing argument suggests the idea’s novelty. But Plato and his peers never doubt that the soul – seen as mind, not simply as plant’s vitality or animal’s movement – actually exists; the self has some essential reality. When I enter most intimately into what I call myself, I always stumble on some particular perception or other, of heat or cold, light or shade, love or hatred, pain or pleasure. I never can catch myself at any time without a perception, and never can observe any thing but the perception. Hume’s point is not that there is no self whatsoever, but that we invent the idea of some essential self; some familiar ‘I’, like Plato’s, which overcomes flux and variety. The mind sees a series of similar impressions, and moves from the idea of ‘similarity’ to the idea of ‘sameness’. Instead of interruption and variability, we have constancy. We “run into the notion,” says Hume, “of a soul, and self, and substance”. 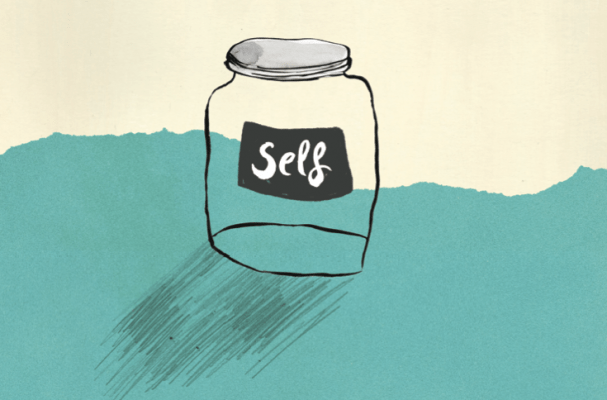 In short: the traditional self is a trick we play on ourselves. Both Plato and Hume, with twenty centuries between them, combine ordinariness and weirdness in their conception of the self. Plato begins with the intellect’s comprehension of abstract concepts, and ends, in some dialogues, with the eternal soul requiring liberation from the body’s prison. Hume begins with the importance of personal experience, and ends with a self lost, like tears in rain. How do we reconcile the ethereal and tangible selves with one another, and with the world? Immanuel Kant, later in the 18th century, replies to Hume. He argues that the unity of the self is necessary for the very personal experience that leads Hume to the conclusion that there is no unified self. For Kant, the world is knowable because we make it so. He writes of two selves: one that senses and perceives, and one that is necessary for sensing and feeling anything at all. I know that my glimpse of the tram stop lovers is mine because this second self provides a unified picture of the world. In Kant’s vision, this picture is the ‘phenomenal’ world: kissers insofar as they appear. Then there is the ‘noumenal’ world: kissers in themselves. Kant is not arguing that the real world is false, just that I cannot experience it directly – human world is humanised by the unifying self. Put simply: my everyday life involves artifice. But in what way am I conscious of this so-called ‘transcendental’ self? With this question, what was just odd becomes a little monstrous. As Slavoj Žižek notes in his essay The Parallax View, the Kantian transcendental self seems to live in a No Man’s Land beyond the world and ourselves. If it is a thing in itself, we cannot be conscious of it at all. If it is a phenomenon, then to whom does it appear? To itself? Then, says Žižek, it is perfectly whole – a noumenal thing, in fact. And so, once again, we cannot be conscious of it. Perhaps it appears to a second self, which requires a third, which requires a fourth, and so on? This exchanges paradox for infinity, and Kant (quite reasonably) never suggests this. One logical reply – how absurd this ‘logical’ sounds – is to accept a kind of in-between stance in which Kant’s self is neither straightforwardly phenomenal nor noumenal. It is a nothingness, between semblance and reality, that is the very condition of both. Things in themselves are a great ‘void’ beyond us – and the self is a great void within us. When, in the pre-Kantian universe, a hero goes mad, it means he is deprived of his humanity, i.e., the animal passions or divine madness took over, while with Kant, madness signals the unconstrained explosion of the very core of a human being. via The self and other explosions | New Philosopher. This entry was posted in Uncategorized and tagged David Hume, philosophy, Plato, Self. Bookmark the permalink.